This guide is intended to serve as a starting point for finding legal information and is intended for public library users and librarians. Need a document? a case, legislation, regulation, legal form? Fill out a request form, and pending availability and any restrictions the document will be delivered to you by means you have selected, during their library hours, approximately 8am-4pm, depending upon location. Have a case delivered to you at no charge, pending any copyright or availability restrictions. Read about their service, fees and contact information. National Conference of State Legislatures join together to discuss issues and post laws state-by-state. What's in the news plus quick links to state legislature websites. A Wall Street Journal reports basic privacy protections lacking. National Conference of State Legislatures posts laws and bills, state-by-state. State-by-state, scroll down for Massachusetts bills. out of personal data which appear on web pages published by third parties." 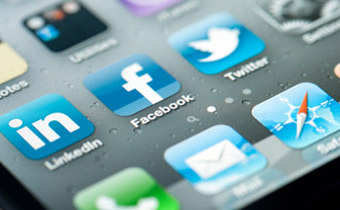 Resources about online privacy: children and the internet, eReader privacy, websites and online services, personal information held by internet service providers, false and misleading statements in website privacy policies, monitoring of employee email and internet access, employer access to social media passwords and more. Definitions, laws, cases linked from Cornell University Legal Information Institute (LII) website. Find laws related to voting. See voting records of U.S. Senators and Representatives under the Federal Law tab's Legislation box. Florence Harding becomes the first First Lady to vote. I'm interested in finding voting records for members of Congress. Can THOMAS help? There are several different ways of voting in the House and the Senate, one of which is the roll call vote, where the vote of each member is recorded. Not all bills, in fact, the minority of bills, receive a roll call vote. The THOMAS home page has a link to roll call votes from 1990 in the House and 1989 in the Senate. Each link lists the roll call votes by sequential roll call number. This number is unrelated to the bill number. You can browse the list of roll call numbers, or you can go to Bill Status in Bill Summary & Status for the given bill and find the vote number (and often a direct link to the roll call vote). THOMAS does not compile votes by members of Congress. However, the Government Resources page contains resources related to congressional votes. Red cover booklet Information for Voters 2016 Ballot Questions, published by William Francis Galvin, Secretary of the Commonwealth. National Conference of State Legislatures, state-by-state information. This application must be received by noon on the day before the election. Find information by clicking on your state. Find notable topics and specific state-by-state ballot questions. The Brennan Center for Justice at New York University School of Law is a non-partisan public policy and law institute...Our work ranges from voting rights to campaign finance reform, from racial justice in criminal law to Constitutional protection in the fight against terrorism. Find categories, such as Popular and Short Titles, Vetoed Bills, Sponsor Summaries and more in addition to bill numbers and their resolution. Search the Congressional Record for remarks by your U.S. legislator. Find your U.S. legislator and bills sponsored. Search by U.S. Congressional session. This Web site is maintained by the National Association of Secretaries of State, the nation's oldest, nonpartisan professional association for public officials. U.S. Department of Justice welcomes your comments and views on voting changes that are being reviewed. American Community Survey (ACS)The American Community Survey helps local officials, community leaders and businesses understand the changes taking place in their communities. It is the premier source for detailed information about the American people and workforce. Check the text, Congressional Record, Committee Reports and more. Links to each representative's homepage for further information. Connect to the homepages of U.S. Senators. Register to vote, apply for an absentee ballot and more. Compare numbers and categories of registered voters in Massachusetts in chart form. 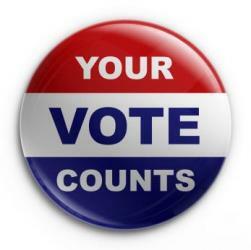 A Preliminary Election will be held on Tuesday, September 17, 2013. Voters in Wards 2-8 will be narrowing the field of Candidates for Mayor to appear on the November 5, Ballot. Voters in Ward One will be narrowing the field of Candidates for Mayor and Ward Aldermen, Ward 1. Verify your place to vote if you live in Newton, MA. NOTICE: The last day to register to vote in the March 1, 2016 Presidential Primaries, or to make changes to your registration, is Wednesday, February 10, 2016. Get quick links to election information, voter registration, voting laws, and what to do if you are in the military or living overseas. State-by-state laws about time off to vote. Click on state-by-state map for requirements and legislation about photos, non-photos, and no voter ID laws. United States Census Bureau has been collecting data since 1964. Some students attending school in Massachusetts may consider their school address their residence for voting purposes while others may still consider their home address their residence for voting purposes. In either case, the student must register in order to be eligible to vote. Voting Rights Act, Sec. 4 (Shelby County, Alabama v. Holder, Attorney General, et al. Choose a state to find out about registration, early voting methods, and more. Choose a state for comprehensive access to laws, regulations, court systems, rules of procedure, legal assistance and more. Find the latest state bills and pending cases mentioned in the news. One stop for sources of laws and cases throughout the U.S. states, territories, Canada and Mexico, plus constitutions, rules of court, administrative law and more. Includes cases from all fifty states, easy to search. Links to six web-based sources. Scroll through the Find Legal Aid tab for the state in which you need legal services. Regulations, court rules, constitutions, and more! Choose your state and find information relating to before, during, after the storm plus funding. See what uniform laws are being enacted this year. Click on the column headers to sort legislation list by State, Bill Date, or Status (or use the filters at right to narrow your results). Choose a state and also find information of interest to all states. Select your state for state-specific directives you can make. Find a topic, click on it, then click on a state to retrieve relevant legal citations and information. Business topics in the side frame or click on a state. 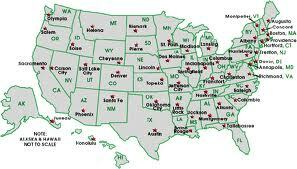 Easy to use state-by-state map arrangement for legal help and resources. Need help defining the type of lawyer you need? Read about professional areas of law here, do a state-by-state search for attorneys, bar associations, state laws, federal and state courts, law schools, cities and towns, and more. Click on a state for minimum wage information. As heard on NPR August 18, 2015. End of life care form in Oregon: Physician Orders for Life-Sustaining Treatment. Special purpose maps generally concentrate on a single theme, such as the Centers of the Population Centers of the U.S. between 1790 and 2000. The cycle of the U.S. Court and State Court System leading to the Supreme Court. Public Access to Court Records System, called PACER, is explained here. Click on a state link and connect to court cases as available. Scroll down to select jurisdiction and court before you search. The National Indian Law Library (NILL) of the Native American Rights Fund (NARF) is a public law library devoted to federal Indian and tribal law. NILL serves the public by developing and making accessible a unique and valuable collection of Indian law resources and assisting people with their Indian law-related information needs. The Tribal Court Clearinghouse is a comprehensive website established in June 1997 to serve as a resource for American Indian and Alaska Native Nations, American Indian and Alaska Native people, tribal justice systems, victims services providers, tribal service providers, and others involved in the improvement of justice in Indian country. Overview: Locate the public record information you can't find with Google . . . or any other online search engine. The Sourcebook provides the information the reader needs to efficiently access public records from over 7,000 courthouses nationwide. 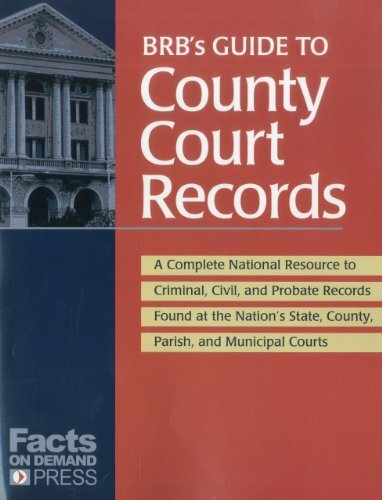 This comprehensive resource provides detailed court profiles including contact information, access methodology, access restrictions, and when signed releases or notarized statements are required. Also, this is the only directory that provides access, copy and certification fees. The CDC provides a link with instructions for obtaining birth, marriage, death and divorce records. Click on a state.